Sorry if I missed this, but whats up with the Caltrans style exit only messaging on the new I-95 signage? Well sort of. As we know Caltrans uses patches for exit only scenarios. They use simply only for freeway-to-freeway interchanges and exit only otherwise. "ONLY" was used on secondary road entrances to I-95 instead of "Exit Only" because the ramps on these non-controlled access roadways are considered to be entrances, not exits. "ONLY" was also used on certain mainline signs (i.e. to Kendrick St C/D road northbound). Due to the lane geometry, and given the width of the signs, it was felt that a full "Exit Only" banner would potentially confuse drivers in the right through lane (despite the arrow). The reason why is because it's telling traffic headed to the Masspike westbound to stay on I-91 North and use Exit 14 to get on the westbound pike since it's the shortest overall route. Eastbound traffic should use I-291 to get on the turnpike instead. If there wasn't a split routing, they wouldn't have posted the advance. You could get on I-291 and enter the turnpike westbound there, but it's a longer, less efficient route. I'm sure such things are noted in other areas where you have a split-type routing, but it's not very frequent. In the pre-AET days, if you accessed the turnpike westbound from I-91 via I-291, you also incurred a higher toll. I just get off St. James St on I-291 and go up Liberty St through Chicopee Falls past the $800 million Pride and then up 33 (cheap gas and booze up there). I think that might be the farthest single-exit advance sign in the state. 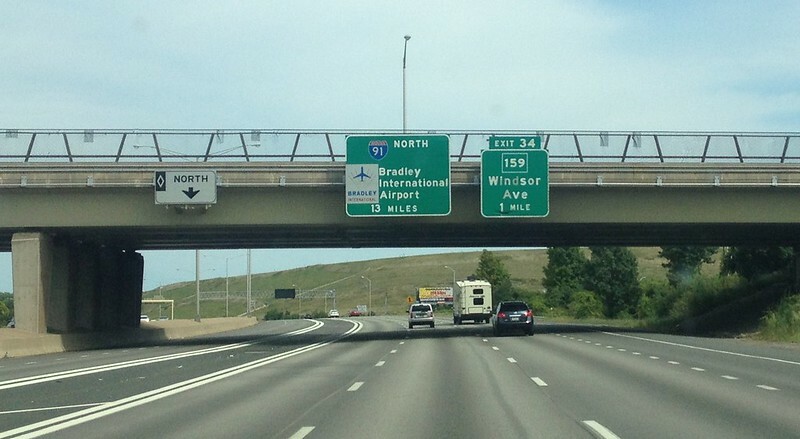 Wasn't or isn't there a 20 mile ahead sign for Bradley Int'l Airport on I-91? Maybe it was in CT proper. Southbound in MA, I think. Couldn't verify that this time around, since I was on an Amtrak train to and from. As for the state line, I had Google Maps track me in Enfield there and Longmeadow back. Looked to be quite accurate, as it's a swampy on either side there. "From this point" as from downtown Springfield? You'd just stay on 91 up to 391 to Chicopee points. Alternatively, 291 to Fuller Road. But that's just to get to Chicopee locations, you wouldn't use those routes to get on the turnpike. 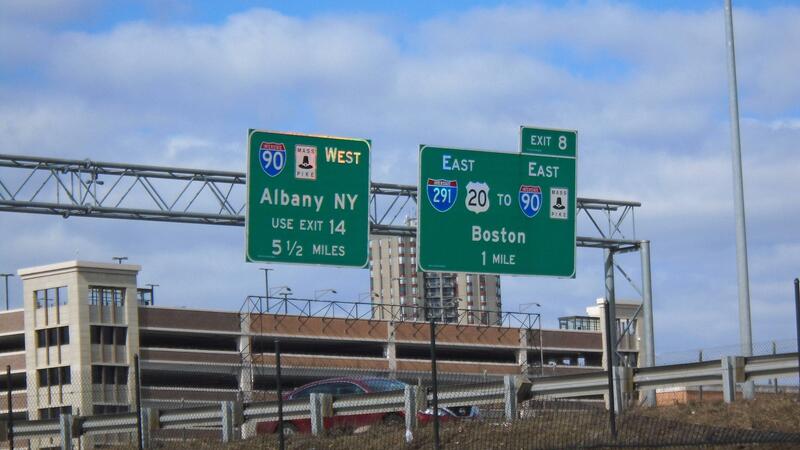 Exit 5 is for local Chicopee traffic and Westover ARB. There isn't a reason to use it to get to Springfield or Holyoke when 4 and 6 exist. On I-91 SB in Longmeadow around MM 1, there's an advance 11 mile Exit 40 sign. There's a 13 mile advance sign for Bradley on the Jennings Rd overpass just past Exit 33 NB. The difference between the 13 mile one in CT and the 11 mile one in MA is that the 13 miles from Jennings Rd is to the airport itself (Exit 33 is at MP 39, and Exit 40 is at MP 48; and CT 20/SR 401 is about a 4 mile jog); where MA signage is to the CT 20 exit on I-91 itself (sign is at MP 1 in MA, then 10 miles from MP 58 to MP 48 in CT). I always thought the fact that it doubled as a pull-through was interesting. I doubt its replacement in the future will be that unique. And over the weekend, I took I-91 North to I-291 East to I-90 West. But I went that direction for the sole purpose of getting shots of the signs on I-291 East. And after going to Exit 4 on I-90, I continued back north on I-91. It didn't cost me anything, as there are no gantries between Exits 4 & 7 on the 'pike. I can't figure out why this sign exists, as it's not for Gillette Stadium or Jordan's Furniture. MA 24 southbound immediately after exiting off I-93. IKEA in Stoughton. Signs were put in by MassHighway at the request of the State Police after a spate of rear-end collisions approaching the Route 139 exit after the store first opened in early 2006. IKEA in Stoughton. Signs were put in by MassHighway at the request of the State Police after a spate of rear-end collisions approaching the Route 138 exit after the store first opened in early 2006. The problem is that sign is about 2-3 miles too early. I also assume you meant the Route 139 exit? Of course the exit is a couple miles beyond that exit. These remind me of the old "Expect Stopped Traffic" signs on the Pike at the Exit 10 complex. I believe they are still up. A few of these signs on the MA 140 freeway approaching the MA 24 North exit, both due to backups on the ramp and due to the abrupt end of the freeway just past it, as this is also an abrupt stop if the light is red. It is quicker from the north to get off at 139 WB and use Turnpike Street to get to IKEA. You've likely never driven on any of the Illinois Tollways. They make that a science. The second photo would also qualify for Department of Redundancy Department, as Genoa Road is noted on two signs, and the bridge as well. How about the Dixon 25 Miles exit sign at Exit 76 on I-88 West in Rochelle, IL? Maybe these women on I-95/MA 128 in Danvers disagreed on the merits of Clearview font? Doubt it! That's actually on "solo" 128, north(east) of Peabody.... not on the I-95 cosigned portion. I was confused at first, and given it was a news report, assumed it was on the I-95 portion, but then I noticed the number of lanes. Thanks for the heads up! I've never been on the MA Route 128-only part by itself! I have been at the exit where the two split off a few times though. Going by Google Street View, the exits actually go DOWN as you head north and east? Huh? Going by Google Street View, the exits actually go DOWN as you head north and east? Huh?